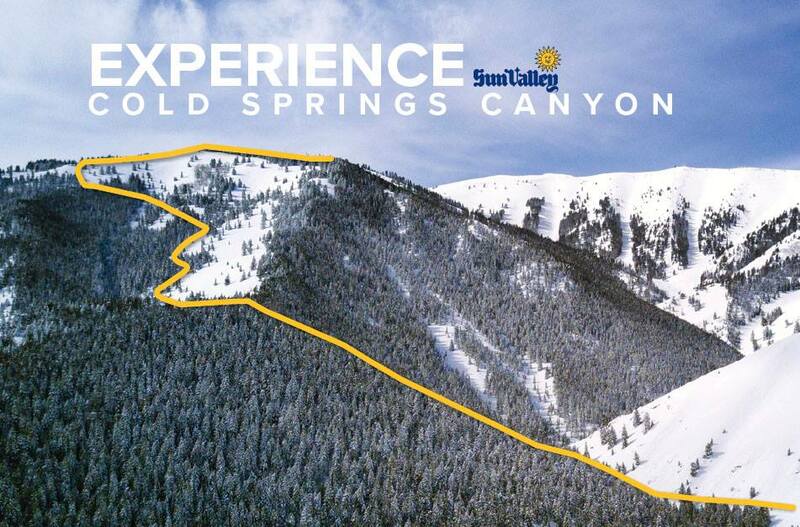 Sun Valley Resort plans to replace its oldest chairlift with a new, longer high-speed quad and open 380 acres of Cold Springs Canyon to skiing in 2018. A future plans webpage launched today details the planned expansion within Bald Mountain’s existing permit area on Bureau of Land Management and National Forest lands. 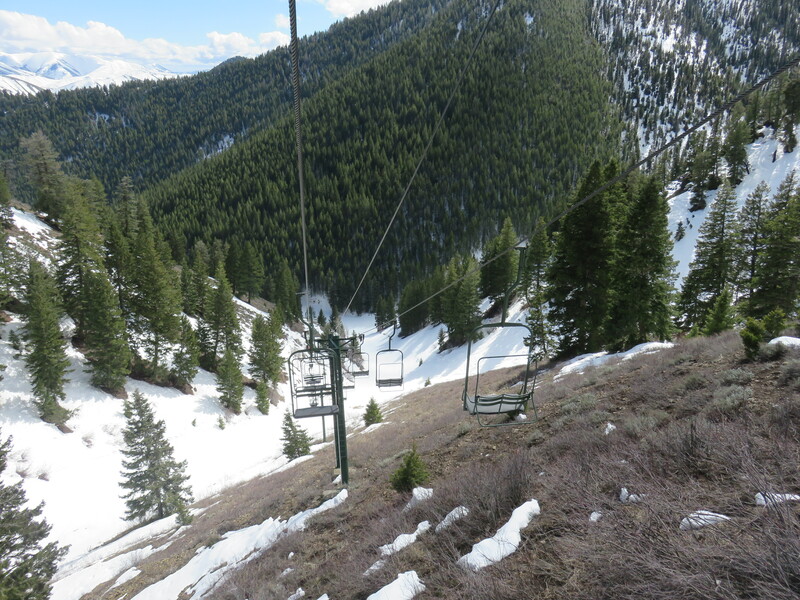 North-facing terrain in Turkey Bowl and Cold Springs Canyon would be gladed with an extended Lower Broadway run leading to the bottom of a new detachable quad chairlift. South-facing terrain underneath the lift would also be opened when conditions permit. Along its 5,500 foot length, the new Cold Springs detachable quad would traverse some crazy side-hill and actually go downhill for a stretch. 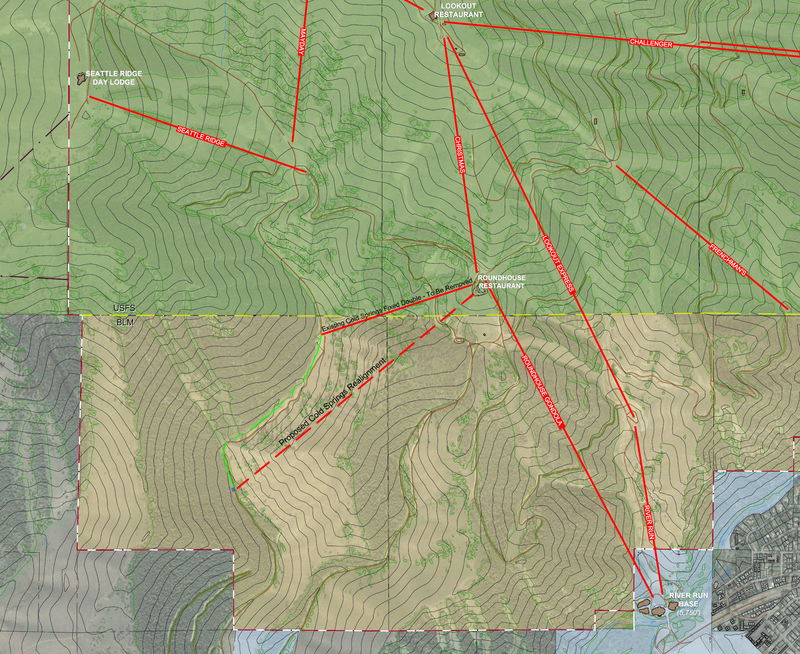 The proposed extended alignment of the new detachable Cold Springs chairlift. The new high speed quad is slated to replace the Cold Springs double, a Yan/Riblet hybrid that dates back to 1970. The new chairlift would be nearly twice as long and rise 1,550 vertical feet, up from the current 1,069′. Ride time would still decrease from 6.7 minutes to 6 minutes with a top terminal moved closer to the Roundhouse Gondola. After the upgrade, Bald Mountain would have only two fixed-grip chairlifts remaining – Mayday and Lookout – with two more left on Dollar Mountain. The Cold Springs double is a Riblet with Yan drive station that changes gauge along its length. 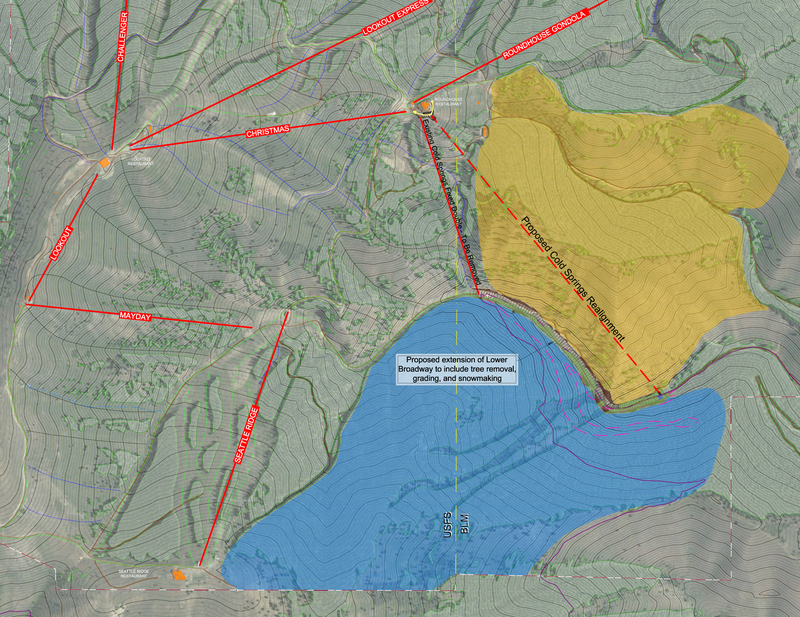 The blue shaded terrain would be added to Bald Mountain’s normal terrain offerings while the yellow areas could be opened in high snow years. Sinclair Oil Corpration, the 82nd largest private company in the United States, owns the Sun Valley Company along with Snowbasin and both resorts are longstanding Doppelmayr customers. 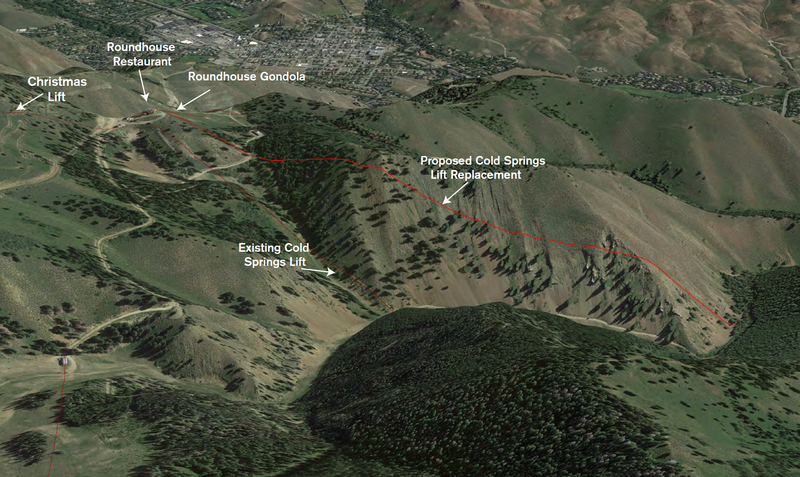 Sun Valley has already submitted the Cold Springs lift replacement and associated projects for approval as an amendment to the 2007 Bald Mountain master plan. An open house will be held on Friday, March 31st at the River Run Day Lodge with representatives from the Sawtooth National Forest and BLM in attendance. If project scoping and approval go as planned, the new lift and runs could open in late 2018. Bummer. I really liked this lift. The bottom terminal was very very cool. But at least Lookout is still safe! I couldn’t get one of the Wildcat chairs from Snowbasin, so maybe I can get one of the chairs from Lookout when and if they do away with her. Skied this lift pod extensively on a Mountain Collective road trip in January. It’s a sleeper area, and the new, blue shaded terrain is some of the steepest in the permit area. Protected from the wind and north facing too. A great addition to Sun Valley! While i can understand that they want to replace the Cold Springs lift given its age, I really question why they are not having the new lift return back to the top of Seattle Ridge to enable round trip skiing of the north facing terrain they are opening up. Understand that it would mean two lifts but seems much more sensible to me. I was thinking the same thing. Looks like a two lift ride, Cold Springs and Seattle Ridge to get back there for a repeat run. Because then the only link back to the rest of the mountain from Cold Springs Canyon would be Mayday, an even longer fixed-grip lift. The main purpose of Cold Springs is to get people back to the Roundhouse. Now boarding: Colorado’s newest gondola. The pinnacle of double chairs. Over the river and through the northwoods. Half way up the longest, tallest and oldest tramway in Canada. 1,499 vertical feet of T-Bar bliss.